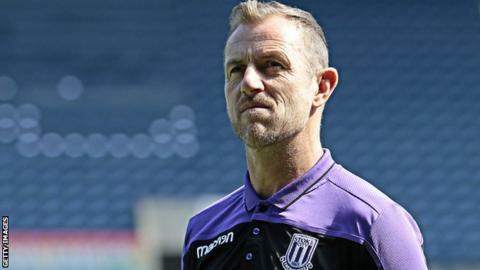 Stoke manager Gary Rowett says his side are "letting themselves down" with their "dopey" play in both boxes after Dwight Gayle's brace saw them lose at West Brom. Gayle put the Baggies ahead early on after turning neatly on a Kieran Gibbs pass before rifling beyond Stoke and England goalkeeper Jack Butland. He doubled the advantage soon after the break before Stoke substitute Benik Afobe saw a penalty come off the bar with 20 minutes to go before Erik Pieters bagged a consolation goal in injury time. "Today probably sums up our first six games of the season to be honest," said Rowett - whose side dropped to 17th place in the Championship having been relegated from the Premier League last season. "We are clearly a good side with good individuals, but we are being a little bit dopey and it is costing us dearly at the minute. "Silly mistakes are impacting the games, because once again I don't think that, for as good a side as West Brom are, they carved us open with great play too many times." In truth, the visitors were fortunate to avoid a heavier defeat against another side who came down from the top flight this summer, as Harvey Barnes and Ahmed Hegazi went close either side of Gayle's opener. But the Baggies were lucky to preserve their lead when James McClean charged down a Sam Johnstone clearance and the ball looped back narrowly over the top. Darren Moore's side then had a goal disallowed on the stroke of half-time after Kyle Bartley used his arm to send the ball beyond Butland. The Potters had arrived in the West Midlands buoyed by back-to-back league and cup wins, but their miserable afternoon was summed up by Afobe's poor penalty after Livermore handled in the box. Pieters smashed in a left-footed drive with all of the five additional minutes played, as Moore - a player under Rowett in the latter's time in charge of Burton Albion - saw his side keep in touch with the early Championship pacesetters. "I actually felt that we caused them far more problems than they caused us, but for whatever reason our quality was lacking," added Rowett. "At the minute we aren't making the positive moments count for us - missing the penalty was a defining point in the game, of course, but there were many others too. "We worked all week on exploiting the spaces that they leave in wide areas and we were able to do that to a degree, but when it matters we weren't able to show the quality that we undoubtedly have. "We are letting ourselves down in both boxes really - we aren't showing enough cutting edge at the top and we are far too easy to score against at the back." It means Stoke end a week which saw the departures of American defender Geoff Cameron and Cameroon international Eric Maxim Choupo-Moting with their third defeat of the campaign. "We set the right tempo and we did what we worked on doing in training. Our ability to manage the ball in large periods of the game meant we had a lot of control. "Being a former defender I'd have liked the clean sheet, but I can't let that detract from a good afternoon's work shown by the players today. "They were stellar finishes [by Gayle]. That's the prowess that Dwight has and he's building a nice relationship and understanding with Jay Rodriguez." Match ends, West Bromwich Albion 2, Stoke City 1. Second Half ends, West Bromwich Albion 2, Stoke City 1. Goal! West Bromwich Albion 2, Stoke City 1. Erik Pieters (Stoke City) left footed shot from outside the box to the top right corner. Assisted by James McClean. Foul by Cuco Martina (Stoke City). Hal Robson-Kanu (West Bromwich Albion) wins a free kick in the attacking half. Attempt blocked. James McClean (Stoke City) left footed shot from the right side of the box is blocked. Assisted by Ryan Woods. Corner, Stoke City. Conceded by Kieran Gibbs. Attempt blocked. Bojan (Stoke City) right footed shot from the right side of the box is blocked. Attempt missed. Matt Phillips (West Bromwich Albion) right footed shot from outside the box misses to the left. Assisted by Hal Robson-Kanu. Attempt saved. James McClean (Stoke City) left footed shot from the left side of the box is saved in the centre of the goal. Substitution, West Bromwich Albion. Gareth Barry replaces Harvey Barnes. Hal Robson-Kanu (West Bromwich Albion) wins a free kick in the defensive half. Substitution, Stoke City. Bojan replaces Peter Etebo. Corner, West Bromwich Albion. Conceded by Erik Pieters. Attempt missed. Joe Allen (Stoke City) header from the centre of the box is just a bit too high. Assisted by Cuco Martina with a cross. Attempt missed. James McClean (Stoke City) header from the left side of the box misses to the left. Assisted by Ryan Woods. Joe Allen (Stoke City) wins a free kick in the attacking half. Kyle Bartley (West Bromwich Albion) wins a free kick on the left wing. Substitution, West Bromwich Albion. Hal Robson-Kanu replaces Dwight Gayle because of an injury. Penalty missed! Still West Bromwich Albion 2, Stoke City 0. Benik Afobe (Stoke City) hits the bar with a right footed shot. Jake Livermore (West Bromwich Albion) is shown the yellow card for hand ball. Penalty conceded by Jake Livermore (West Bromwich Albion) with a hand ball in the penalty area. Attempt blocked. Ryan Shawcross (Stoke City) header from the centre of the box is blocked. Assisted by Peter Etebo with a cross. Corner, Stoke City. Conceded by Sam Johnstone. Attempt saved. Bruno Martins Indi (Stoke City) left footed shot from outside the box is saved in the bottom left corner. Assisted by Benik Afobe. Delay in match Dwight Gayle (West Bromwich Albion) because of an injury. Corner, Stoke City. Conceded by Ahmed Hegazi. Attempt saved. Harvey Barnes (West Bromwich Albion) left footed shot from the centre of the box is saved in the centre of the goal. Assisted by Chris Brunt. Attempt blocked. Benik Afobe (Stoke City) header from the centre of the box is blocked. Assisted by James McClean with a cross.